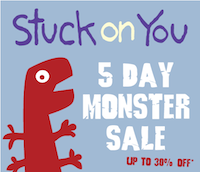 Stuck On You Canada has a sale on now which will end on Tuesday 10th August which they dubbed their Monster Sale, with discounts of up to 30% off a wide range of their merchandise. And we are also bringing a coupon code for visitors to get an additional 10% off! Stuck On You or aka stuckonyou.biz is a label website (like lots we have on here), that allow you to make or buy personalized labels for yourself or for your kids or whatever you need labels for. Shipping is completely free on all Canada orders from StuckOnYou which is cool and the sale for 30% off is no joke, combined with your additional 10% off and free shipping you have yourself one of the best deals for personalized labels right here in Canada (based out of BC).